I'm always delighted to find new resources. I consider one of my tasks as a Christian lady in life and online, to discern, enjoy, and pass on solid resources to fellow lady believers. It's one of the ways I believe it's good to use the gift of the Spirit of discernment the Lord graciously gave me. I'm also grateful to have been born in this era, where so much teaching is available to us via the world wide web. I came across Betty J. Newman and want to share her with you. Described as "the Will Rogers" of Bible Study teachers, Betty possesses a natural talent and passion for teaching. With her soft Southern Appalachian accent and dialect, Betty will share solid Bible study teaching and make you feel comfortable and right at home. 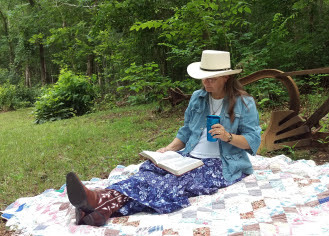 "Farm wife/mother/grandmother/writer and teacher at Newman Valley Farm & Prayerlogue Bible Studies and Hand to the Plow on NRBTV." I listened to an audio teaching from Acts, a lesson Genesis 1, and a lesson on "The 'Real' Lord's Prayer' from John. There is quite a lot of teaching so perhaps 3 lessons aren't proportional in the scheme of what is available, but I believe this sampling is representative of Mrs Newman's teaching overall. I enjoyed the Genesis 1 lesson. Mrs Newman has a great way to set the context and acknowledging the history. Her early declaration that she believes it literally was a relief, for this is proper interpretation. She explained the Logos and rhema but as Will Rogers had a talent, hers also is being down to earth when explaining lofty concepts. She makes it understandable. From what I've seen via listening and reading the titles and headlines of the material, the content focuses simply on explaining the word of God, no cultural commentary, no politics, just Bible teaching. My opinion is that Mrs Newman is a good teacher. But content is is not all that makes a good teacher. How about delivery? I find that often, amateur teachers who have a podcast or video lessons (as Mrs Newman has both) have annoying verbal tics that make it hard to listen to the content. The Sheologians' constant giggling, (c'mon girls, you tout yourselves as serious, then belie that immediately with the comedy routine!) Paul Washer's intermittent yelling, Martyn Lloyd-Jones' nasal accent and exaggerated rolled r's, others' umms and ahhs or worse, 'like, like, like' make the listener have to listen around the tics to get to the content. John MacArthur has a voice that is well modulated. This means the voice is simply the vehicle to carry the words, making the words come front and center. Mrs Newman's delivery is smooth with no stumbles or tics. It is easy to listen to, meaning one is listening to what she is saying rather than how she is saying it. She also teaches at her own church, which is another positive. Sad to say, many Bible teachers with online content these days either aren't a member of or don't attend their own local church. I like to know they are active and under submission to an ecclesiastical authority in real life. Anyway, use your discernment and see what you think. This could be a good fit for you as I believe it is for me. Falling overboard...will he remember me? It's payday, so that means...buying books!